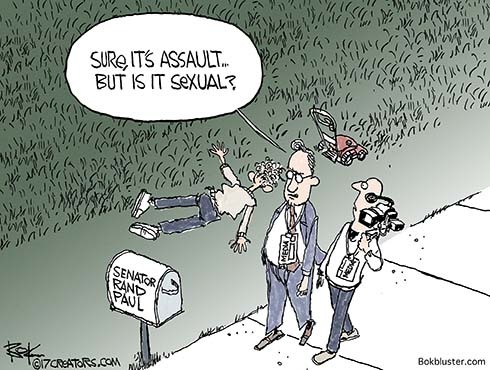 Republican Senator Rand Paul’s next door neighbor did a yard job on him. He blindsided the senator while he mowed the grass. As a result the ophthalmologist/senator spent Thanksgiving recovering from 6 broken ribs and a punctured lung. Everyone, that is, except the media. Mrs. Paul doesn’t think this is about leftover fish sticks. And in light of last summer’s shooting of Congressman Scalise she thinks there ought to be more interest. Update: Senator Paul now says he knows why he was attacked. But he isn’t talking. Instead he’s hired a personal injury lawyer.